With aging comes a whole lot of changes and you get prone to a lot of diseases. Your organs does not seem to function in the same manner that it did when you were young. Have you ever heard of gout? Gout is caused by too much uric acid in the body. Uric acid comes from the breakdown of substances called Purines. Purines are found in all of our body’s tissues. They are also present in many foods such as liver, dried beans and peas as well as anchovies. Those afflicted with gout know too well the agonizing pain that comes with having them that stems from a joint—often the one at the base of the big toe—where uric acid crystal accumulates and forms because of the build-up of uric acids in the bloodstream. Thank God, there’s Goutritis. 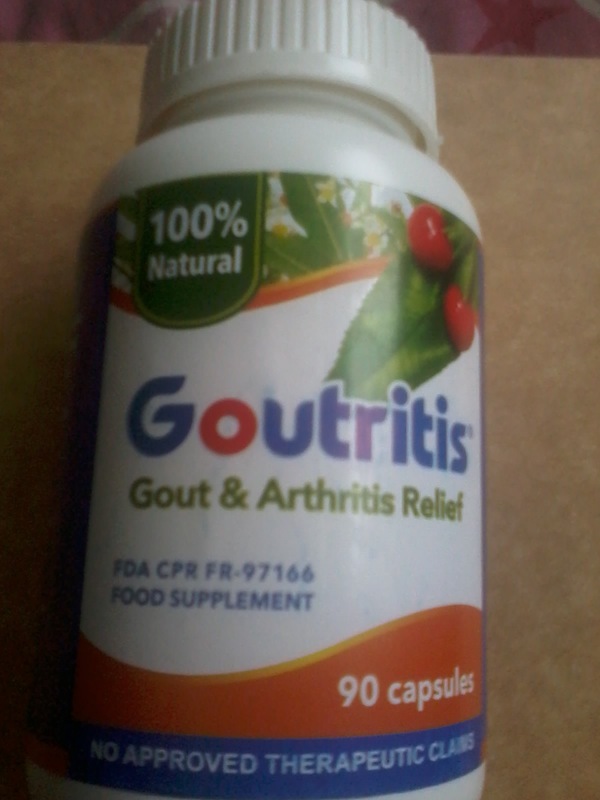 Goutritis is an all-natural food supplement that contains tart or sour cherries, which have a high amount of anthocyanins, antioxidants and potassium. When combined, these natural nutrients effectively and safely lessens inflammation and contribute to alkalizing the body, which is helpful in reducing pain associated with gout. For three capsules taken daily before breakfast, the patient will manage his gout on top of a doctor’s orders to take the prescribed medication, maintaining a healthy and balanced diet low on Purine-rich foods and drinking plenty of water to further flush out the body’s excess uric acid, maintaining a healthy body weight and exercising regularly. 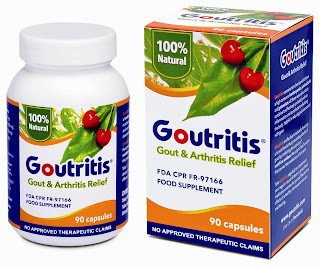 Goutritis can help ward off these painful attacks because its main ingredient, tart cherries (Prunus ceranus), contains a lot of healthy substances that combine to ease this painful affliction. Included is Quercitin, which prevents swelling by inhibiting the release and production of histamine, which causes inflammation. Tart cherries also contain a subclass of flavonoids called anthocyanins that can block pain and reduce levels of uric acid. The anthocyanins in tart cherries inhibit xanthine oxidase, an enzyme involved in the production of uric acid. Tart cherries are high in antioxidants, which are important to gout patients because of their ability to fight free radicals that are responsible for damaging cells and slowing down the repair and recovery mechanism of the human body. Other substances in tart cherries are potassium, an important electrolyte which helps the body excrete excessive amounts of uric acid. Potassium helps provide fluid balance and maintain proper kidney functions. It helps gout patients by turning the hard painful crystals into a liquid form that the kidneys can process in order to eliminate it during urination. Tart cherries also contain Vitamin C and fiber. Studies show that consistent intake of Vitamin C can help reduce uric acid levels by up to 50 percent, and control inflammation of gout-ravaged joints, which is a primary cause of severe gout pain. Although an average serving of tart cherries offers only 2g of fiber against the recommended daily dose of 24g, it is a start in the right direction for gout patients who are advised to maintain a healthy weight. 524-6549, 354-2208 to 09 and 09474890262. It is currently sold in jars of 90 capsules priced at P900. For additional product information, email info@goutritis.com or visit www.goutritis.com and www.facebook.com/GoutritisSupplement. Superbook is back on GMA 7 Beginning June 1!